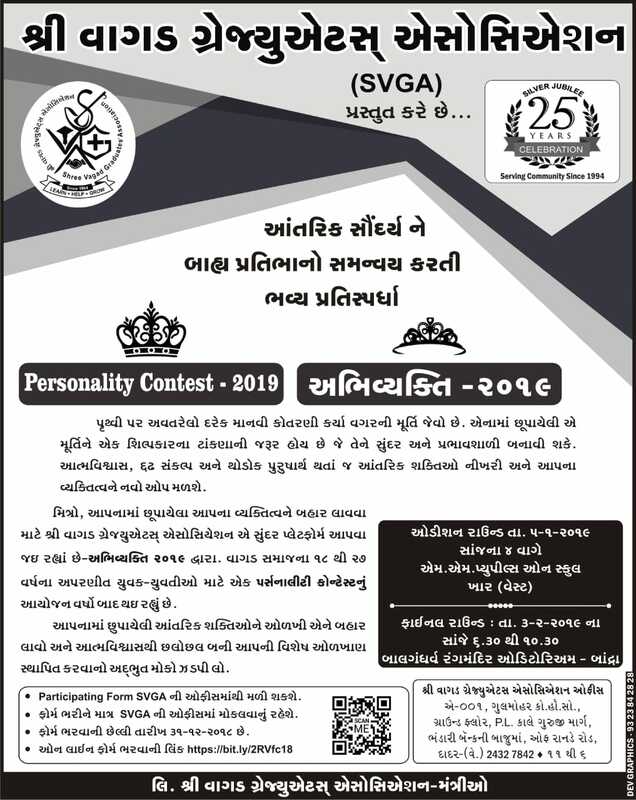 SVGA is Super thrilled to bring to you Abhivyakti 2019, a Personality Contest held in keeping with our Silver Jubilee Year Celebrations, for the youth of Vagad. The perfect mix of beauty, brain, and talent, this contest will help you bring out the best in you and will reward you with the title of the most awe-inspiring personality from the young generation of Vagad. Enter the contest and give a platform to your many talents, your wit, your beauty and battle out to win the title of Mr. Vagad and Miss Vagad. Send in your entries and kick start on your journey to being the best version of yourself!! The participant must be from Vagad Visa Oswal Community Only. The participant should be above 18 and up to 27 years of age as on 4th January 2019. The participant must have to be an unmarried as on 3rd February 2019. Any false information given by any participant at any stage will lead to automatic disqualification. The decision of the judges or SVGA would be final and binding on all the participants and no clarification would be issued to any participants for any decisions. The participant is requested to ensure that their attire, attitude, presentation and language is in keeping with dignity of the event and maintain code of conduct. The participant agrees to abide by all rules and/ or terms and conditions of competition as prevailing or changed from time to time by SVGA in its sole discretion. Rs. 300/- donation must be made while participating in the competition. Last date to submit the entry form is Monday, 31st December 2018 by 5 PM. Entry form and donation must be submitted online (https://bit.ly/2UNEaBz) or at Shree Vagad Graduates Association (SVGA), A-001, Ground Floor, Gulmohar CHSL, P.L. Kale Guruji Marg, Off. Ranade Road, Bhandari Bank, Dadar (W), Mumbai-400028. Tel – 022 24327842/9022313382. All the participants who will be selected in the Audition Round will get 3 Grooming Sessions each before the Final Round. Elimination Round – Saturday, 5th Jan 2019 4:00 pm onward at M.M. Pupils School, Khar – West. Final Event – Sunday, 3rd Feb 2019 6:30 pm onward at Bal Gandharva Rang Mandir, Bandra – West. A Grand Opening to the Silver Jubilee Year Celebration. 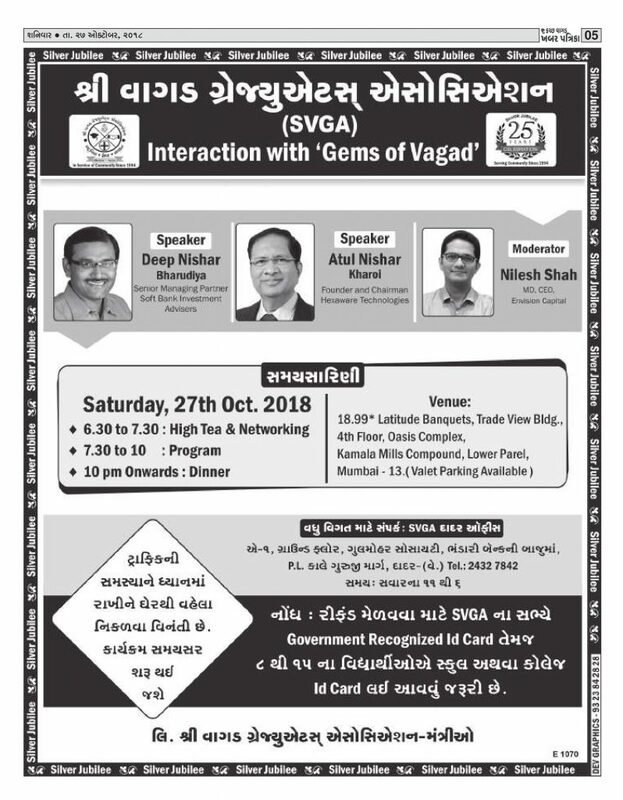 Date: Saturday 27th October 2018. Venue: 18.99 Latitude Banquets, Lower Parel.